Invest in a privacy fence for your property this summer! Do you have a fence on your property? Have you ever considered investing in one? There is a vast variety of fences available today. One of the most popular options in residential settings is privacy fences. In addition to providing privacy, they have several other benefits that are frequently go unrecognized. Consider the following, and you may realize that a privacy fence should be in your future! One of the most significant benefits of privacy fences is that they are built to last and require very little maintenance. Most privacy fences can be cleaned with a pressure washer and some soap. Over the years, you may need to replace a board or some hardware here or there, but you shouldn’t need to make any major repairs. If your privacy fence is wood, you can increase its lifespan by applying stains and paints. Mother nature can be relentless. Strong winds and various forms of precipitation can take its toll on your property if you are not careful. A sturdy privacy fence can act serve as a barrier from wind to protect your plant life. Also, privacy fences are generally pretty tall and can provide much-needed shade if your yard does not have any tree coverage. If you live in a busy neighborhood, it is nice to have a means to reduce the sound levels in your property. Many homeowners do not realize that a privacy fence can help to lessen the noise that enters your property. 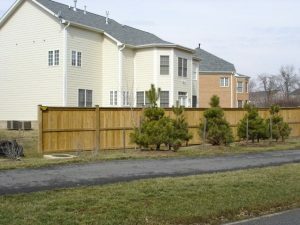 For example, if you live on a busy street, a privacy fence can reduce the amount of street traffic you hear at night. It can be stressful having to always keep an eye on your pets and children as they run around your backyard. If you want to ensure that your little ones do not run off when you have your back turned, a privacy fence will help ensure they stay on your property. No matter what type of fence you have decided on, Hercules Fences has the expertise and equipment to construct your dream fence. Our experienced team can help meet your fencing needs, whether they are residential or commercial, for the right price. Give us a call at 804-752-7992 or visit us online. To see examples of our work and keep in touch, don’t forget to follow us onFacebook, Twitter, Google+, LinkedIn, Flickr, and Pinterest. This entry was posted on Friday, June 8th, 2018 at 3:45 pm. Both comments and pings are currently closed.